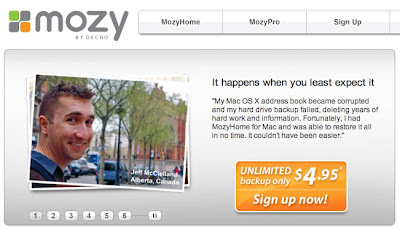 Mozy is an online data backup service perfect for those worried about losing their digital music library (like me). Users can get 2 GB of storage for no charge and unlimited storage for $4.95. Creating a new account and backing up data is very easy and, more importantly, the clear calls to action and simple workflow make for a great overall experience. 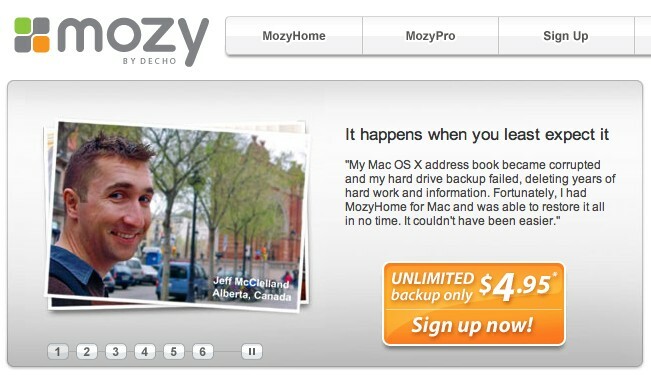 The cleanly designed homepage and prominent 'Sign up now!' button clearly tell users what they can do right from the start. Creating an account was very fast (about 3 minutes); I chose the monthly payment option, presented credit card information and quickly downloaded the application to my Mac. Once the setup was completed, I was able to configure my backup by checking boxes for each type of data (iTunes library, photos, etc.) and begin the backup process. Although the first backup can take several days, I'll sleep better knowing that my Smiths bootlegs are now safe and secure.